" EXCLUSIVE: Former Gov. 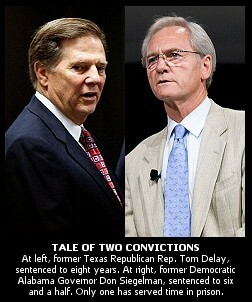 Don Siegelman Brings the Hammer Down on Tom DeLay from Prison	"
Ever since last week's reversal of former GOP Rep. Tom DeLay's 2010 money laundering convictions by a 2-to-1 partisan decision of a three-judge Texas appeals court panel, we have been contrasting the Texas Republican's treatment in the judicial system with that of Alabama's former Democratic Governor Don Siegelman. Now, the last Democratic governor to serve Alabama is speaking up for himself, in a statement he's furnished to The BRAD BLOG from federal prison, slamming DeLay for what he describes as his part in a $20 million criminal conspiracy with convicted GOP uber-lobbyist Jack Abramoff, Karl Rove, Ralph Reed, Grover Norquist and others to defeat him in his bid for re-election, and to ensure he never took office again. In his statement, the former governor speaks out against "The Hammer" and hammers him hard for what he describes as collusion to "engineer a money laundering scheme to defeat me in my race for re-election as governor and to elect Karl Rove's and Tom DeLay's Republican colleague from the U.S. House, then Congressman Bob Riley." "I know first-hand, personally --- what I'm about to tell you is not hearsay," Siegelman writes about the alleged scheme to remove him from office through a late night ballot tampering scheme. He explains how the conspiracy resulted in robbing him of his 2002 re-election after it had already been called in his favor by all the networks. Later, before Siegelman --- the only person to hold all four top statewide offices in Alabama history --- could run for Governor again, he says the same cabal worked to have him thrown in jail on what appear to be trumped up charges brought by a Bush Administration prosecutor who also happened to be married to Riley's Chief of Staff. DeLay's conviction was reversed last week after the two Republican judges on the TX appellate court determined [PDF] that $190,000 in corporate funds given to DeLay's political action committee, Texans for a Republican Majority (TRMPAC), in 2002 (the same year that Siegelman's election night "victory" was reversed) was legally contributed to DeLay's organization and, thus, could not be seen as "proceeds from criminal activity". That, they said, would be required to sustain the money laundering charges DeLay was found guilty for, beyond a reasonable doubt, by 12 jurors in 2010. The one Democratic judge on the panel, the court's Chief Justice, dissented [PDF] in the appeal, arguing that the funds were indeed criminal proceeds, and that DeLay laundered them when his PAC gave the money to a Republican National Committee PAC, along with instructions to pass that money, in turn, back to seven specific candidates for the TX state legislature in 2002. It's illegal under Texas law for corporations to give money directly to candidates, but DeLay's scheme --- swapping soft money for hard through the transactions from the TX fund to the national fund and then back to the TX candidates --- resulted in that $190,000 in corporate funds being given directly to candidates nonetheless. Despite his original 8-year sentence on the two money laundering-related charges, DeLay was immediately released on bail pending appeal after his sentencing, and never served a night in prison. After the court's decision last week, the Travis County, TX District Attorney vowed to seek a review of the lower court's partisan opinion from the Texas Court of Criminal Appeals, the court of last resort for criminal matters in the Lone Star State. In contrast, Siegelman was literally shackled and hauled away to prison immediately after his sentencing on bribery-related charges in which prosecutors were unable to show any personal enrichment by the Governor. He was finally released on bail, pending appeal, nine months later. He was then ordered back to federal prison last September after a first round of appeals. He currently awaits another appeal and a hoped-for pardon from the President. The former Governor seemed to be in remarkably good spirits when we spoke to him, coincidentally, for a few minutes from prison just days before the ruling came down in the DeLay case. Given the tone of the statement he provided to The BRAD BLOG this week, it's clear that Siegelman is less than pleased with DeLay's Texas ruling, which, for now, appears to let "The Hammer" off the hook, despite Siegelman "first-hand" knowledge of what he describes as "laundering money to elect state Republican candidates pure and simple." Tom DeLay was not acquitted because he had the "joy of Jesus" in him but rather because he had two Republican Judges for him. The facts are the facts: Tom DeLay was laundering money to elect state Republican candidates pure and simple. I know first-hand, personally --- what I'm about to tell you is not hearsay. Tom DeLay and his co-conspirators Jack Abramoff and Mike Scanlon helped engineer a money laundering scheme to defeat me in my race for re-election as governor and to elect Karl Rove's and Tom DeLay's Republican colleague from the U.S. House, then Congressman Bob Riley. Public campaign finance disclosure documents in the Alabama Secretary of State's and at the Federal Elections Commission show the flow of legally laundered money. Now, in Jack Abramoff's book, "Capitol Punishment" he admits for the first time to money laundering to the tune of some $20,000,000 dollars "to stop Siegelman." Abramoff had a dual interest in defeating me. One to befriend Karl Rove and also to please his client, the Mississippi Band of Choctaw Indians, who viewed me as a "threat" after my election as Governor in 1998. I was proposing a gaming initiative in Alabama, a lottery to fund free college education. Abramoff says in his book the Alabama lottery would wreck the gambling monopoly of the Choctaws and I had "to be stopped." The Choctaw Indian casinos hired Abramoff, Scanlon, Ralph Reed and Grover Norquist. They "war gamed an aggressive tactic" according to Abramoff "to stop Siegelman...at a cost to the Choctaws of approximately $20,000,000." Tom DeLay was part of the conspiracy to defeat me. The Hammer, in concert with his Republican co-conspirators, began laundering thousands of dollars through his Texas ARMPAC to a front group the Alabama ARMPAC, a political action committee, to funnel illegal contributions to my opponent, Tom DeLay's colleague and Jack Abramoff and Rove's friend, Congressman Bob Riley. Riley had befriended Abramoff by voting in lock step with Abramoff's clients on multiple congressional votes at a time when Mike Scanlon was first working for Riley as a congressional aide before he changed jobs to work for DeLay. DeLay didn't stop with sending illegal funding to my Republican opponent; he also funneled money to The Alexandria Group, a lobbying firm with Abramoff and DeLay ties. The money coincided with the hiring of a self-described "Ballot Security Expert", a man named Dan Gans. Gans, who had been on Riley' staff, was in a remote South Alabama Republican-controlled county the night of my re-election. All the votes were in and counted, and all networks had called the election in my favor. Then after midnight, the poll watchers and media were sent home. In the basement of the courthouse, a couple of people were still at work in the Sheriff's office. A computer glitch was discovered. A private recount took place to "correct" the "computer glitch" giving my opponent just enough votes to be declared the winner. The next morning my margin of victory was erased. I asked for a hand recount of just one voting place. The state attorney general, Karl Rove's client, stepped in and stopped the recount. Then contrary to state law, the secretary of state and the attorney general declared my opponent the winner. Dan Gans who then was working for the Tom DeLay/Abramoff affiliated Alexandria Group took credit on their website for my defeat as the "Ballot Security Expert" who found the votes to make the Tom DeLay's protégé the winner. The Hammer may have the joy of Jesus to thank for his mental tranquility but he must thank his Republican friends for his acquittal. « PREVIOUS STORY "'Green News Report' - September 24, 2013"
"EXCLUSIVE: Former Gov. Don Siegelman Brings the Hammer Down on Tom DeLay from Prison"
I remember reading Legal Schnauzer on this, but do you know if any real legit investigation has taken place? Many Blogs wrote about Siegelman at the time and tried to point specific things out connecting Rove. They just seem to have dropped off the screen. These guys are unrepentant sociopaths. If they are not stopped, God help the country. "I start from the supposition that the world is topsy-turvy, that things are all wrong, that the wrong people are in jail and the wrong people are out of jail, that the wrong people are in power and the wrong people are out of power, that the wealth is distributed in this country and the world in such a way as not simply to require small reform but to require a drastic reallocation of wealth. I start from the supposition that we don't have to say too much about this because all we have to do is think about the state of the world today and realize that things are all upside down." - Howard Zinn, The Problem is Civil Obedience May 1970. The case that Mr. DeLay has been fighting only has to do with Texas candidates. It was held in Texas courts and talked about money raised in Texas, given to the RNC, then RETURNED TO TEXAS CANDIDATES. At no time is Alabama mentioned or even alluded to. He may be confusing it with the Federal investigation into Jack Abramoff in which Tom DeLay was completely exonerated and dropped from investigating when it was clear he didn't do anything wrong. Y'all need to get your facts straight. There has never been a clearer example of IOKIYAR than this. BTW Brad, I had an identity theft scare so I pulled all of my PayPal accounts as a precaution. I will restore ASAP. Yes, of course, the case against DeLay related solely to Texas candidates. DeLay was charged in state court with violation provisions of a state Elections Code. Sigelman was the victim of a federal prosecution engineered by Rove et al. for political purposes. He is truly a political prisoner. What Sigelman adds is the background which places DeLay at the heart of the same corporate money laundering scheme in Alabama. Siegelman is a political prisoner. Where is the ACLU regarding his case? More proof Obama is a POS neocon wolf in sheeps clothing, and Justice is a four letter word in this country. Truly disturbing. "y'all" guy you need to read Larissa Alexandrovna's series on this case, and apparently you have no sense of right or wrong if you don't see the injustice here- plus, what of Abramoff's own admission? The man was robbed of his office, then robbed of his freedom, while his family was robbed of a husband and father. And Delay goes a-walkin. F*cking banana republic America. Why didn't the national Democrats come to the defense of Don Siegelman? The only thing necessary for evil to triumph is for good people to do nothing - and that is exactly what the Democrats did. Can't Obama at least pardon Siegelman? Republicans are ruthless when it comes to punishing their enemies and helping their allies. Democrats are more likely to victimize their allies than their enemies.